A short note to let everyone know who won the prizes from the 5 County Snowman Shuffle. Becky Margison from Shelbyville was the Grand Prize winner of 5 - $50.00 Gift Certificates! Congratulations, Becky!! The winner of the Gift Basket at Tree City Stitches was Jane Ritter of Milroy! Congratulations to Jane! Alesia Willett of Kentucky won the Gift Basket at The Quilter’s Nook! Congratulations! 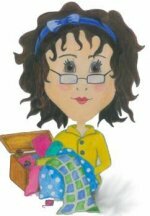 In Stitches’ Gift Basket winner was Donna Hermisch of Greensburg! Congratulations! Helen Face of Hope won the Gift Basket from Sharynn’s Quilt Box in North Vernon. Congratulations, Helen!! Sew Crazy in Columbus, IN was our newest shop and their winner was Bev Heckham! Congratulations!! We want to again thank everyone who participated and we enjoyed seeing everyone!